2. It would suit any recipient - male, female, young or older. 4. You can play around with the theme and colours. You could just use one type of fabric, plain or printed fabric, alternate fabric colours and prints, or use a contrasting coloured or metallic thread. 5. 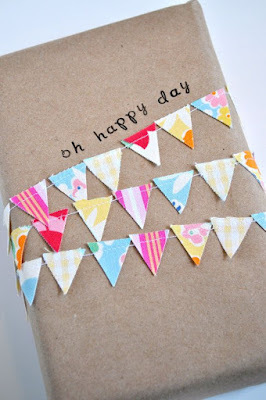 The bright colours of this bunting look great set against the natural kraft paper used here. 6. The handwritten message and haphazard way the bunting is wrapped around the gift all add to the handmade charm! Do you keep a diary? If so, what do you find beneficial about journaling? Author of The 4-Hour Work Week, Tim Ferriss is a huge advocate of keeping a diary and reveals some of his journaling tips here. 1. Why do you keep a diary? What do you think are the main advantages of keeping a diary? I keep a diary to keep track of my thoughts and have the ability to revisit them at a later time. The main advantage of keeping a diary is that it keeps my mind on my work and forces me to hone my writing skills. 2. How long have you kept a diary for and why did you start? I've been keeping a diary for about a year now, and I really got started to supplement my professional writing. 3. How often do you write in your diary – is it a regular thing, or just when you need to? How much do you write? Typically I write a few times a week, a few hundred words each time. 4. What sort of diary or journal do you write in? Do you write by hand in a notebook or electronically on your computer or other device? I prefer writing by hand in a notebook I've bought just for that purpose, usually right before retiring for the night. 5. 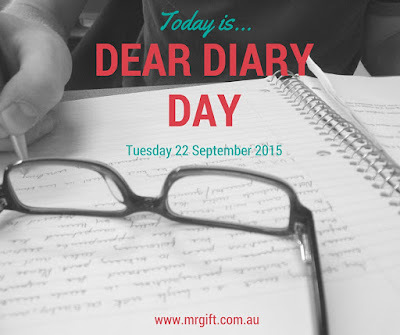 Do you think there are any disadvantages to keeping a diary? Are you concerned someone else might read it? None I can think of. I also write knowing somebody in the future might read it.